Two medals won by late Welsh football great John Charles during his time in Italy have sold at auction for £8,200. One which was given to him for helping Juventus to the Italian league title in 1960, fetched £5,800 and the other went for £2,400 at the sale in Hull. The Swansea-born player, who died in 2004, is regarded as one of Wales' greatest players. 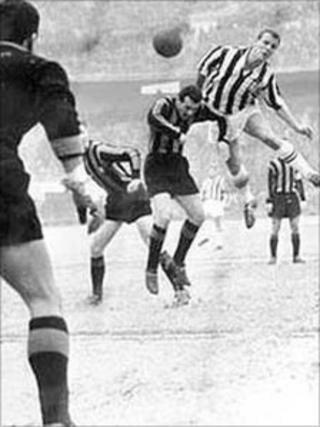 He joined Juventus for £65,000 in 1957, winning three championships and the Italian cup in five years at the club. Charles, known as the Gentle Giant, also played for Leeds, Cardiff and Roma and represented Wales at the World Cup in Sweden in 1958. A medal presented to him for winning the Italian league in 1958 sold at auction last year for £8,880. Wednesday's auction was staged by Gilbert Baitson in Hull. Cultural historian and football fan Prof Peter Stead, from Swansea, met Charles several times. He said: "John Charles was one of the greatest British players ever. "He was the best in the world at his time and he was a big star in Italy. "He was one of the most important people in Italian football and was voted the best player in Italy. He was regarded by Juventus as one of their greatest forwards ever." Charles left his home city of Swansea to sign for Leeds at the age of 17 and settled in Leeds after his football career was over. "It was absolutely a stellar career," added Mr Stead. "He was a great athlete, a remarkable footballer and a lovely man and we should not forget that either."